Field Service | Credencys Solutions Inc. The client is one of the top three industry players that offer managed services for the installation, servicing, and maintenance of laundry machines (washers and dryers) at high demand locations across the US and Canada. The client’s source of revenue is money operated machines where users insert coins and use washers and dryers. Another source of revenue is servicing and repairs as required. The client has an installed base of small to large-scale laundry rooms at commercial establishments (hotels, hospitals, etc.) and residential locations. Credencys developed a mobile application that simplified key processes and workflows for the client. One of these processes is coin payment collection and related reconciliation. The coin counting solution now allows coin collectors to record machine count data in the mobile phone rather than recording the data in paper slips. This data is sent real-time to the back-end system which allows branch managers to perform reconciliation in 2 days, instead of the earlier 60-120 days. 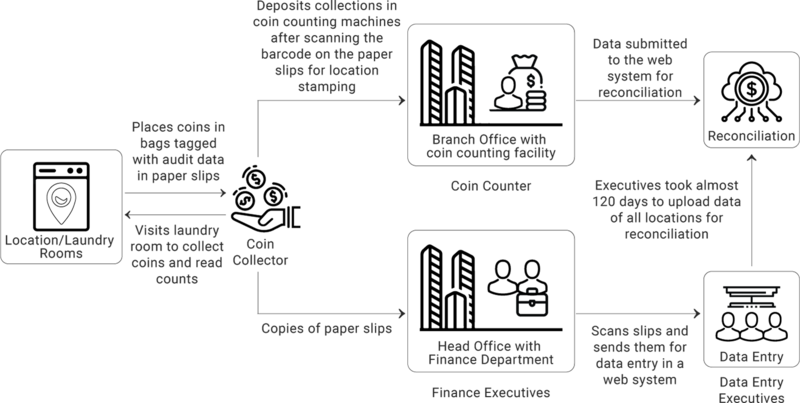 The paper-dependent coin counting process was transferred to a digital platform. Coin collectors now use the company supplied mobile applications to update numeric data. Benefit: Increased accuracy and efficiency for field staff as they can now update numeric data on the go using their mobile phone rather than using paper (which is more error-prone). Coin collectors can access their audit schedules on the go in their mobile applications. They no longer visit branch offices to collect their schedules. This also eliminated loss of information and any communication gaps. Benefit: Saves a lot of time for field staff, eliminates loss of information. Coin collectors can access the data of assigned locations/laundry rooms from their mobile phones, instead of collecting slips. They can fill the total count of all the machines and submit the data on the backend system using the coin counting solution, directly from their apps. Benefit:Elimination of data entry staffing, as coin collectors can upload the counts in the backend system using the mobile app. While visiting a location/laundry room, the coin collectors now carry QR code embossed smart bags to collect coins. 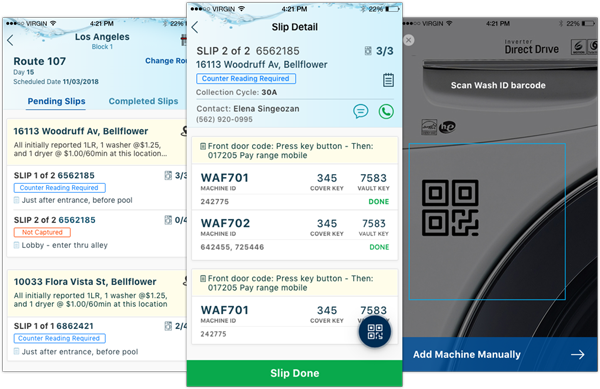 The QR code can be mapped to a particular location/laundry room and collection slip. It can be scanned via the mobile app to access location detail and collection slip of the respective location. Moreover, while depositing coins into the coin counting machine, coin collectors have to scan the QR code embossed on the bag. Finance executives can compare the counts submitted by coin collectors, which are simultaneously tracked by coin counting machines for each particular location. Benefit:Count tracking becomes easy and fast using location-based QR Codes. Once the coin collectors submit the coin counting details using the mobile app, the data gets synced with the backend revenue reconciliation application. Branch managers can review the collections data and related counts in real-time. Benefit:The client now gains real-time insights for collections within 2 days, significantly reducing the client’s revenue cycle. Consequently, Wash can share revenue with respective partners and property owners faster, leading to higher partner retention and acquisition, implying more customers for the client that their partners have access to. Coin collectors can store coin count values even in the absence of internet connectivity. They can submit the data once the internet is available. The data is synced with the backend system immediately. Benefit: No process disruption despite internet unavailability. Coin collectors can now collect the data and submit it in real-time using the mobile app. The solution directly syncs the data to the backend via the web, without intervention from a data entry executive. The operational hierarchy and paper dependent workflows which were earlier required have been completely eliminated, thereby directly reducing significant manpower costs and operational bottlenecks for the client, leading to improved efficiency and economy. Branch managers can track payment values in real-time. They can gain real-time and actionable insights into the revenue performance of each location, with the ability to roll up and draw quick comparisons. The client gains real-time insights for collections within 2 days, and reconciles revenue data faster than ever before. They can share revenue with respective partners and property owners faster, leading to higher partner retention and acquisition, and consequently, more new customers, making them more competitive in the market. The real-time and consistent availability of information also helps them define specific time durations and schedules for machine servicing in order to maintain the operational efficiency of washers and dryers, with minimal downtime. Previously, there was a large delay in reconciling the counter reading data. With the mobile solution, the data entry process that earlier took 4 months to update branches has drastically reduced. Now the same data is updated in a fraction of a second, with no additional staffing required.